Without the right visualization tools, raw data is of little use. Data visualization helps present the data in an interactive visual format. Here are the qualities to look for in a data visualization tool. According to a survey by Salesforce, 53% employees say that organizing data for easy viewing takes manual effort. A good data visualization tool should help you take care of that. You could roll out scrolls of data in spreadsheets and charts and reams, but unless there’s a way to crunch the numbers and visualize them in a way that makes more sense, all that data is just a sea of numbers. High quality visualization tools are crucial for your data analytics strategy. Essentially, data visualization tools are software that help present the data in a visual, pictorial format, presenting a wholesome image of the data, to help your team better understand it. Pie charts, graphs, heat maps, histograms and radar/spider charts are just a few of the many creative ways to present data in a nutshell and showcase highlights and trends. Check out this interesting taxonomy from Duke University to see all the various forms of data visualization formats available today to get an idea of how creative you can get with your data visualization. So to make your data analytics truly useful and insightful, you need the right visualization tool. There are plenty of good ones in the market, with different features and prices. We have a list of the best ones at the end of this post. Understandably, choosing the right one for your enterprise is no mean feat and you need to undertake some careful deliberation before choosing the one visualization tool you can bet your money on. The dashboard could easily be called the very face of a data visualization program. Just like one look at your car’s dashboard gives you all the vital information you need, from how much gas you have left to how fast you’re going and how much longer you can go before you have to refuel. Similarly, a visualization dashboard should be able to present all the key information in a glance. A good data visualization dashboard should be a few things simultaneously. For starters, it should look great. It needs to be clear, with pops of color amid adequate whitespace. Too white is boring and too much color is overwhelming. The dashboard should strike a balance. However, good looks are enough, said no one ever. The dashboard should be able to accurately summarize all the data that matters. The top KPI’s you are trying to track, the vital trends you are monitoring or any other dataset that is pivotal to your business should be clearly visualized on the dashboard in a way that you have the general overview within a few seconds of launching the dashboard. Facts presented on the dashboard should be clear and decipherable in a glance. Another very important quality a dashboard must possess is customizability. At any given time, your company may be tracking dozens of different datasets. You should have the power to customize which datasets appear prominently on the dashboard. Different teams have different priorities and hence, the data visualization tool must allow complete customizability. Here’s a great article on how good dashboards can empower and liberate businesses. The ability to seamlessly integrate the visual reports into any other applications you use is important to really utilize the power of data visualization. For your teams to work efficiently, collaborate better and share across different platforms, the data visualization software must have the feature to allow using the various media like graphs and charts into different applications. The quality and richness of the visual reports should not diminish when transporting it onto a different application. The reports should still remain interactive and allow further investigation of the data. Not all departments need to analyze all the high-level data your tool collects. Most of them would only want one part of that data to seamlessly integrate with their specific applications. They need immediate actionable insights that can help them increase the efficiency of their tasks and campaigns. A good data visualization tool must allow for easy embeddability. The visual reports generated by a data visualization tool must be extremely interactive, allowing easy investigation into trends and insights. Interactive data visualization helps identify trends and tell a story through data. So how does the predictive trend change when you tweak just one variable? You should be able to move, sort, filter and move variables until you find the answers you are looking for. Data analysts and decision makers need to be able to collate data from various sources and combine datasets to produce insightful reports. The tool should allow for the reports to be viewed in various different formats and different parts can be highlighted at different times. Industry specific KPIs need to be customized to provide tailored insights. To enable all of this, your business intelligence and data visualization needs to be highly interactive. Importing raw data to the visualization tool and then exporting the visual reports in various different forms is something that needs to be managed by the company in the way it likes. Some datasets can be fed into the tool in their rawest form while others will need to be aggregated first because they are too large. Sometimes, data can be taken from just one source while sometime it needs to be collected from different sources and visualized by the tool. While most data visualization tools will collect data from multiple sources and display it on the same dashboard, there are some that may not have this capability. 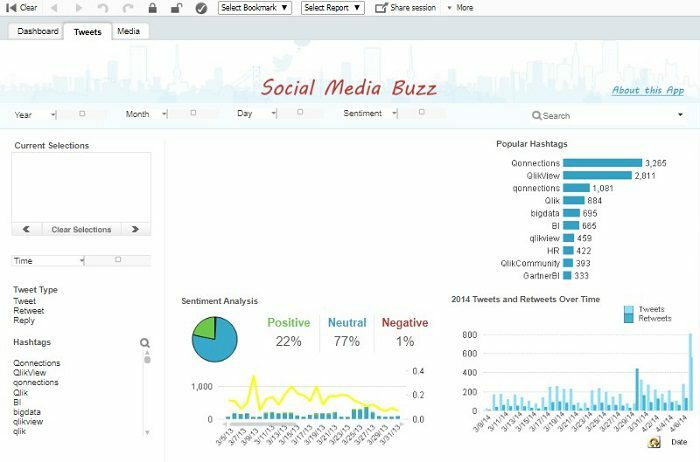 How you want to share the reports will also matter to the tool you choose. Do you need reports to be automated? Do reports need to be shared among teams? Do you wish to export data out of the reports? If you’re in a business where the geo location matters, you may need to look into the location intelligence in your data visualization tool. Where is your data coming from? Which states or regions are more actively using your services and which areas need more work? The ability to layer sets of data chronologically and spatially is important for businesses that need to track location based KPIs. Data Mining is the process of studying large data sets to indentify patterns and trends in it. If you deal with large datasets and would like your visualization tool to help distill all the information in them and yield visual reports, then that’s another feature you’ll need to look for in your visualization tool. Many visualization tools off late have been getting smarter with their use of artificial intelligence to analyze, explore and predict trends to go as far as suggest future actions based on past trends. If that’s something that appeals to you, that’s another feature you could look for. 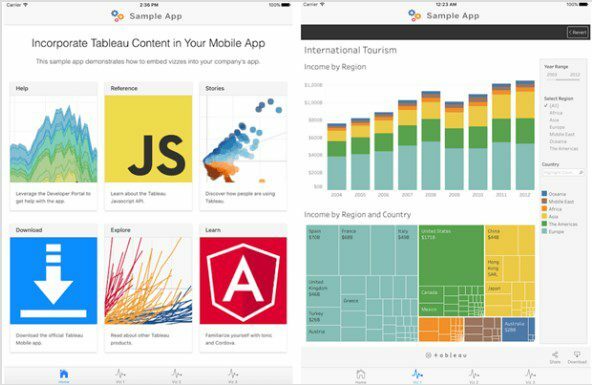 Here’s a list of the some of the best and most preferred data visualization tools available today, and how they stack up in terms of the above qualities, to help you decide which one would be right for you. Customizable dashboards that is embeddable with applications like Salesforce, SharePoint and Jive etc. Hundreds of data connectors including Facebook, Salesforce etc. Choosing the right data visualization tool is a big decision not only because they are fairly expensive, but also because they play a huge role in shaping your business strategy. A tool that can present the most clear, interactive and accurate visual reports can help you take better decisions, make better plans and track your KPI’s better. So depending on what features matter most to your business, choose a tool that will give you just the representations you need. Bio: Hiral Atha is the Founder and CEO of MoveoApps, a mobile apps development company. With over 14 years of experience in tech and software development, she has managed and led several app development projects from ideation to implementation.